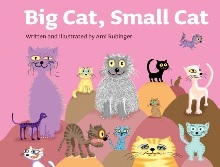 An interactive book about cats that introduces children to rhyming and opposites in a fun and engaging way. <><> Big Cat, Small Cat takes readers through a fantastical world of felines, where they will encounter many different pairs of cats—from good and bad to happy and sad. This delightful iBook’s sing-song text leaves out the last word of each page, allowing little ones to chime in and complete the rhyme. Captivating, colorful illustrations provide clues for the words that have been left out. Introducing words like “dirty,” “clean,” “nice,” and “mean,” Big Cat, Small Cat teaches children about rhyming and opposites with a fun, fill-in-the-blank challenge that encourages participation. Review: A totally cute story that had my little ones glued to the screen of my computer while we were reading. Interactive and engaging, with colorful pictures and easy to follow lines. It made for a great educational read for my 4 year old :) I had to read it 5 times when we first got it. The kids were so excited about the pictures of the cats and guessing what would come next.